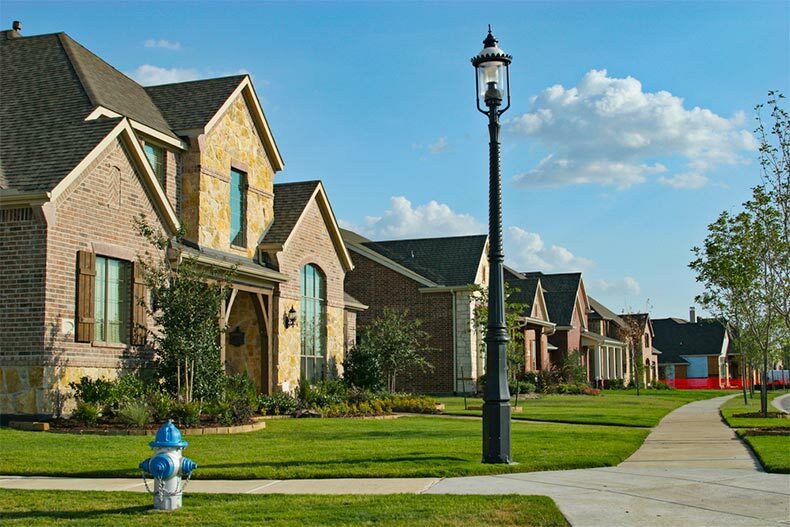 Suburban Dallas is full of 55+ communities with homes priced around $250,000. Dallas may have a reputation for glitz and glamour, but there are many 55+ communities for active adults who want to maintain a reasonable budget. The best lowest-priced communities in North Texas can be found all over Big D, whether you desire suburban living in Fairview or you want to be close to the big-city action in Frisco or Southlake. Active adult homebuyers who dream of living in Dallas but want to stick to a budget of about $250,000 will delight at all they receive at these phenomenal age-restricted communities. Check out these neighborhoods with homes available for $250K. Developed between 2007 and 2014, Villas in the Park in Fairview offers active adults a tranquil taste of Texas at an affordable price point. This active lifestyle community contains miles of hiking and biking trails, serene parks, a scenic pond, and a gazebo. At the neighborhood clubhouse, residents can stay fit in the exercise room or mingle with friends at parties in the multi-purpose room. Available on a resale-basis only, Villas in the Park contains 227 low-maintenance, single-family and attached homes that feature private outdoor spaces and desirable open floor plans. Active adult homebuyers who crave luxurious amenities and upscale homes will relish living in Watermere at Southlake. This age-restricted community contains many posh amenities, including yoga and pilates studios, an on-site restaurant, café and lounge, a full-service bar with regular happy hours, and a full-service day spa that offers massages along with hair and nail services. Residents can live life to the fullest in this vibrant community, which offers a state-of-the-art fitness center, indoor lap pool, library, billiards and cards room, tennis court, and a stocked lake for fishing. Active adults can choose from a variety of attached and custom homes or explore a collection of luxury custom cottages. Situated in the desirable city of McKinney, Villas at Willow Grove gives active adults a rich lifestyle at a reasonable price point. This charming community promotes a physically and socially active lifestyle through a clubhouse, well-equipped exercise room, pool, patio, and picnic and barbecue areas. Dog lovers can meet like-minded friends and let their four-legged family members romp at the on-site dog park. Those who enjoy evening strolls can soak in the natural beauty of the community garden and tranquil pond. Ranch-style homes in this age-restricted community are available on a resale-only basis and include many elegant features such as granite countertops and dramatically tall ceilings. Isabella Village at Savannah is situated within the spectacular master-planned community of Savannah in Aubrey. Here, active adults can experience a high quality of life while still staying within their budget. The 20,000 square-foot Club Savannah stands at the heart of the community, offering homeowners a well-stocked library, stunning ballroom, a cozy café with a juice bar, and a kitchen for catering fun events. Residents also have access to a three-story fitness center topped off with a craft room on the third floor. Dog owners can head to the community dog park and let their loyal friends get some exercise. Active adult homebuyers will be delighted at the energy efficient and desirable upgrades of the homes within Isabella Village. Active adults who dream of living in a brand-new active lifestyle community in the Dallas-Fort Worth area will be enchanted by Ladera Mansfield. This age-restricted neighborhood in Mansfield puts new homes within reach for many active adult homebuyers. Started in 2015, Ladera Mansfield will contain 186 homes offered in nine models. The community also offers a select number of attached homes. Whatever style and floor plan active adults choose, they will be impressed at the many luxurious features in this community, from stainless steel appliances and granite countertops to crown molding and tray ceilings. A homeowners’ association takes care of lawn maintenance and landscaping, giving residents more time to enjoy the community’s outdoor heated pool and firepits, walking and biking trails, and pickleball and bocce ball courts. Low-maintenance, carefree living comes at an affordable price at The Village at Prestonwood in Plano. This gated community is ideal for active adults who desire a lock-and-leave or a permanent residence. Here, residents can get to know their neighbors in a fun and relaxing environment, whether they meet up for a morning jog or soak up the sun at the pool. This age-restricted community also contains a 24-hour fitness center, catering kitchen, and great room. Retirees will feel right at home in one of these low-maintenance homes, which feature spacious floor plans, high ceilings, and walk-in showers.